Today is the 17th university of the Omagh Bombing when 29 INNOCENT people , including women, children and visitors from other countries were slaughtered by Republican Terrorists on the streets of Omagh. This was among the worse attacks on Civilians throughout the Troubles and the images of that day are embedded ( along with the Shankill Bomb ) in my soul. I grew up on the Shankill Road and surrendering areas during the worst years of the troubles and I can assure you I have seen my fair share of misery and bloodbaths , as the Republicans dragged Northern Ireland to hell and back in their quest for a United Ireland. I’ve lost count of how many friends and family I have seen destroyed as a direct result of the conflict , either killed, imprisoned or emotionally crippled by the things they have seen and done. But for some reason The Omagh Bombing struck me hard and has a permanent place in my heart and soul. Things have moved on and Northern Ireland is painfully, slowly crawling towards a better future.These things take time , but one day in the distant future, when we are all dust and wind , our children’s grandchildren will wonder what-it-was–all-about and the names of dead and their brutal slaughter will fade into the dark corridors of time . From County Donegal. Killed in car bomb explosion, Market Street, Omagh, County Tyrone. Inadequate warning given. Spanish visitor. Killed in car bomb explosion, Market Street, Omagh, County Tyrone. Inadequate warning given. Killed in car bomb explosion, Market Street, Omagh, County Tyrone. Inadequate warning given. Injured in car bomb explosion, Market Street, Omagh, County Tyrone. Inadequate warning given. He died 5 September 1998. The red Vauxhall Cavalier containing the bomb. This photograph was taken shortly before the explosion; the camera was found afterwards in the rubble. The Spanish man and child seen in the photo both survived. The Omagh bombing (Irish: Buamáil an Ómaigh) was a car bombing that took place on 15 August 1998 in Omagh, County Tyrone, Northern Ireland. It was carried out by the ‘Real IRA‘, an IRA splinter group who opposed the IRA’s ceasefire and the Good Friday Agreement. The bombing killed 29 people and injured about 220 others. This was the highest death toll from a single incident during the Troubles. Telephoned warnings had been sent about 40 minutes beforehand, but they were inaccurate and police had inadvertently moved people toward the bomb. The bombing caused outrage both locally and internationally, spurred on the Northern Ireland peace process, and dealt a severe blow to the ‘dissident’ republican campaign. The Real IRA apologized and called a ceasefire shortly after. The victims included people from many backgrounds: Protestants, Catholics, a Mormon teenager, five other teenagers, six children, a woman pregnant with twins, two Spanish tourists, and other tourists on a day trip from the Republic of Ireland. It has been alleged that the British, Irish and American intelligence agencies had information which could have prevented the bombing; most of which came from double agents inside the Real IRA. This information was not given to the local police; the Royal Ulster Constabulary (RUC). In 2008 it was revealed that British intelligence agency GCHQ was monitoring conversations between the bombers as the bomb was being driven into Omagh. Negotiations to end the Troubles had failed in 1996 and there was a resumption of political violence. The peace process later resumed, and it reached a point of renewed tension in 1998, especially following the deaths of three Catholic children in Orange Order-related riots in mid-July. Sinn Féin had accepted the Mitchell Principles, which involved commitment to non-violence, in September 1997 as part of the peace process negotiations. Dissident members of the Provisional Irish Republican Army (PIRA), who saw this as a betrayal of the republican struggle for a united Ireland, left to form the Real Irish Republican Army (RIRA) in October 1997. The RIRA began its paramilitary campaign against the Agreement with an attempted car bombing in Banbridge, County Down on 7 January 1998, which involved a 300 pounds (140 kg) explosive that was defused by security forces. Later that year, it mounted attacks in Moira, Portadown, Belleek, Newtownhamilton and Newry, as well as bombing Banbridge again on 1 August, which caused thirty-five injuries and no deaths. 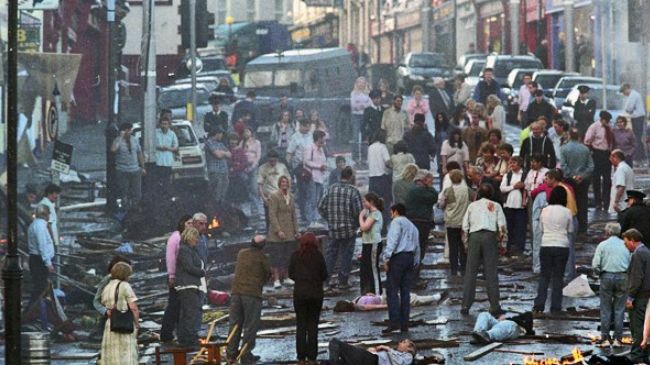 The attack at Omagh took place 13 weeks after the signing of the Good Friday Agreement, which had been intended to be a comprehensive solution to the Troubles and had broad support both in Ireland and internationally. 17 May 1973 – Arthur Place (29), Derek Reed (28), Sheridan Young (26), Barry Cox (28) and Frederick Drake (25), all off duty members of the British Army, were killed by a Provisional Irish Republican Army booby trap bomb while getting into a car, outside the Knock-na-Moe Castle Hotel, Omagh. Drake died on 3 June 1973. 25 June 1973 – Sean Loughran (37), Patrick Carty (26) and Dermot Crowley (18), all Catholics and members of the Provisional Irish Republican Army, were killed in a premature bomb explosion while travelling in a car, Gortin Road, near Omagh. On 13 August, a maroon Vauxhall Cavalier was stolen from outside a block of flats in Carrickmacross, County Monaghan, in the Republic of Ireland. At that time it bore the County Donegal registration number of 91 DL 2554. The perpetrators replaced its Republic of Ireland number plates with false Northern Ireland plates and the car was loaded with a bomb. On the day of the bombing, they drove the car across the Irish border and at about 14:19 parked the vehicle filled with 230 kilograms (510 lb) of fertiliser-based explosives outside S.D. Kells’ clothes shop in Omagh’s Lower Market Street, on the southern side near the crossroads with Dublin Road. They could not find a parking space near the intended target, the Omagh courthouse. The car (with its false registration number MDZ 5211) had arrived from an easterly direction. The two male occupants then armed the bomb and upon exiting the car, walked east down Market Street towards Campsie Road. Some Spanish tourists stopped beside the car, and were photographed. 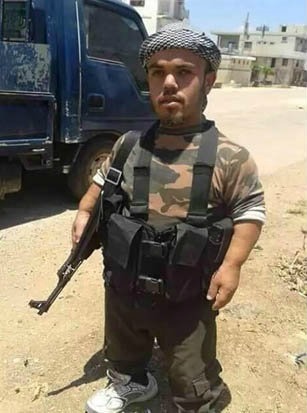 The photographer died in the bombing. Three phone calls were made warning of a bomb in Omagh, using the same codeword that had been used in the Real IRA’s bomb attack in Banbridge two weeks earlier. At 14:32, a warning was telephoned to Ulster Television saying, “There’s a bomb, courthouse, Omagh, main street, 500lb, explosion 30 minutes.” One minute later, the office received a second warning saying, “Martha Pope (which was the RIRA’s code word), bomb, Omagh town, 15 minutes”. The caller claimed the warning on behalf of “Óglaigh na hÉireann”. The next minute, the Coleraine office of the Samaritans received a call stating that a bomb would go off on “main street” about 200 yards (180 m) from the courthouse. The recipients passed on the information to the Royal Ulster Constabulary (RUC). The BBC News stated that police “were clearing an area near the local courthouse, 40 minutes after receiving a telephone warning, when the bomb detonated. But the warning was unclear and the wrong area was evacuated”. The warnings mentioned “main street” when no street by that name existed in Omagh, although Market Street was the main shopping street in the town. The nature of the warnings led the police to place a cordon across the junction of High Street and Market Street at Scarffes Entry. They then began to evacuate the buildings and move people down the hill from the top of High Street and the area around the courthouse to the bottom of Market Street where the bomb was placed. The courthouse is roughly 400 metres (1,300 ft) from the spot where the car bomb was parked. Injured survivor Marion Radford described hearing an “unearthly bang”, followed by “an eeriness, a darkness that had just come over the place”, then the screams as she saw “bits of bodies, limbs or something” on the ground while she searched for her 16-year-old son, Alan. She later discovered he had been killed only yards away from her, the two having become separated minutes before the blast. In a statement on the same day as the bombing, RUC Chief Constable Ronnie Flanagan accused the RIRA of deliberately trying to direct civilians to the bombing site. British government prosecutor Gordon Kerr QC called the warnings “not only wrong but… meaningless” and stated that the nature of the warnings made it inevitable that the evacuations would lead to the bomb site. The RIRA strongly denied that it intended to target civilians. It also stated that the warnings were not intended to lead people to the bombing site. During the 2003 Special Criminal Court trial of RIRA director Michael McKevitt, witnesses for the prosecution stated that the inaccurate warnings were accidental. The BBC News stated that those “who survived the car bomb blast in a busy shopping area of the town described scenes of utter carnage with the dead and dying strewn across the street and other victims screaming for help”. The injured were initially taken to two local hospitals, the Tyrone County Hospital and the Erne Hospital. A local leisure centre was set up as a casualty field centre, and Lisanelly Barracks, an army base served as an impromptu morgue. The Conflict Archive on the Internet project has stated that rescue workers described the scene as “battlefield conditions”. Tyrone County Hospital became overwhelmed, and appealed for local doctors to come in to help. British Prime Minister Tony Blair visited Omagh days after the bombing. 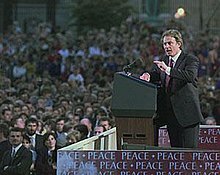 This photograph shows Blair addressing a crowd in Armagh several weeks later. The nature of the bombing created a strong international and local outcry against the RIRA and in favour of the Northern Ireland peace process. British Prime Minister Tony Blair called the bombing an “appalling act of savagery and evil.” Queen Elizabeth II expressed her sympathies to the victim’s families, while the Prince of Wales paid a visit to the town and spoke with the families of some of the victims. The Pope and US President Bill Clinton, who shortly afterwards visited Omagh with his wife Hillary, also expressed their sympathies. Social Democratic and Labour Party leader John Hume called the perpetrators of the bombing “undiluted fascists”. Sinn Féin leader Martin McGuinness said that, “This appalling act was carried out by those opposed to the peace process”. Party president Gerry Adams said that, “I am totally horrified by this action. I condemn it without any equivocation whatsoever.” McGuinness mentioned the fact that both Catholics and Protestants alike were injured and killed, saying, “All of them were suffering together. I think all them were asking the question ‘Why?’, because so many of them had great expectations, great hopes for the future.” Sinn Féin as an organization initially refused to co-operate with the investigation into the attack, citing the involvement of the Royal Ulster Constabulary. On 17 May 2007, Martin McGuinness stated that Irish Republicans would co-operate with an independent, international investigation if one is created. 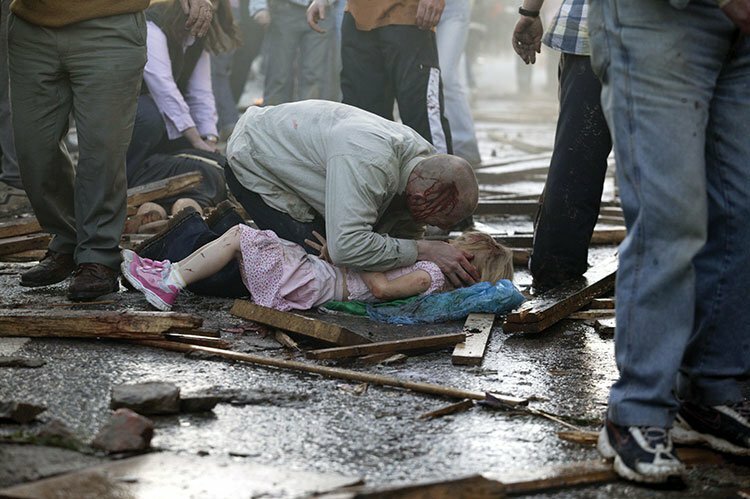 On 9 October 2000, the BBC’s Panorama programme aired the special Who Bombed Omagh? hosted by journalist John Ware. The programme quoted RUC Chief Constable Ronnie Flanagan as saying, “sadly up to this point we haven’t been able to charge anyone with this terrible atrocity”. The programme alleged that the police on both sides of the Irish border knew the identity of the bombers. It stated that, “As the bomb car and the scout car headed for the border, the police believe they communicated by mobile phone. This is based on an analysis of calls made in the hours before, during and after the bombing. This analysis may prove to be the key to the Omagh bomb investigation.” Using the phone records, the programme gave the names of the four prime suspects as Oliver Traynor, Liam Campbell, Colm Murphy, and Seamus Daly. The police had leaked the information to the BBC since it was too circumstantial and coincidental to be used in court. Northern Ireland Secretary Peter Mandelson praised the Panorama programme, calling it “a very powerful and very professional piece of work”. Irish Taoiseach Bertie Ahern criticised it, saying that “bandying around names on television” could hinder attempts to secure convictions. First Minister David Trimble stated that he had “very grave doubts” about it. Lawrence Rush, whose wife Elizabeth died in the bombing, tried legally to block the programme from being broadcast, saying, “This is media justice, we can’t allow this to happen”. Democratic Unionist Party assembly member Oliver Gibson, whose niece Esther died in the bombing, stated that the government did not have the will to pursue those responsible and welcomed the programme. The police believe that the bombing of BBC Television Centre in London on 4 March 2001 was a revenge attack for the broadcast. On 9 April 2003, the five RIRA members behind the BBC office’s bombing were convicted and sentenced for between 16 and 22 years. On 22 September 1998, the RUC and Gardaí arrested twelve men in connection with the bombing. They subsequently released all of them without charge. On 25 February 1999, they questioned and arrested at least seven suspects. Builder and publican Colm Murphy, from Ravensdale, County Louth, was charged three days later for conspiracy and was convicted on 23 January 2002 by the Republic’s Special Criminal Court. He was sentenced to fourteen years. In January 2005, Murphy’s conviction was quashed and a retrial ordered by the Court of Criminal Appeal, on the grounds that two Gardaí had falsified interview notes, and that Murphy’s previous convictions were improperly taken into account by the trial judges. On 28 October 2000, the families of four children killed in the bombing – James Barker, 12, Samantha McFarland, 17, Lorraine Wilson, 15, and 20-month-old Breda Devine – launched a civil action against the suspects named by the Panorama programme. On 15 March 2001, the families of all twenty-nine people killed in the bombing launched a £2-million civil action against RIRA suspects Seamus McKenna, Michael McKevitt, Liam Campbell, Colm Murphy, and Seamus Daly. Former Northern Ireland secretaries Peter Mandelson, Tom King, Peter Brooke, Lord Hurd, Lord Prior, and Lord Merlyn-Rees signed up in support of the plaintiffs’ legal fund. The civil action began in Northern Ireland on 7 April 2008. On 6 September 2006, Murphy’s nephew Sean Hoey, an electrician from Jonesborough, County Armagh, went on trial accused of 29 counts of murder, and terrorism and explosives charges. Upon its completion, Hoey’s trial found on 20 December 2007 that he was not guilty of all 56 charges against him. 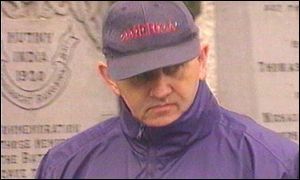 On 24 January 2008, former Chief Constable Ronnie Flanagan apologised to the victims’ families for the lack of convictions in relation to the Omagh bombing. This apology was rejected by some of the victims’ families. After the Hoey verdict, BBC News reporter Kevin Connolly stated that, “The Omagh families were dignified in defeat, as they have been dignified at every stage of their fight for justice. Their campaigning will go on, but the prospect is surely receding now that anyone will ever be convicted of murdering their husbands and brothers and sisters and wives and children.” Police Service of Northern Ireland Chief Constable Sir Hugh Orde stated that he believed there would be no further prosecutions. On 8 June 2009, the civil case taken by victims’ relatives concluded, with Michael McKevitt, Liam Campbell, Colm Murphy and Seamus Daly being found to have been responsible for the bombing. Seamus McKenna was cleared of involvement. The others were held liable for £1.6 million of damages. It was described as a “landmark” damages award internationally. Murphy and Daly appealed and were granted a retrial, but this second trial also found them responsible for the bombing, with the judge describing the evidence as overwhelming. On 10 April 2014 Daly was charged with murdering the 29 victims of the Omagh bombing and with other offences. Daly lived in Cullaville, County Monaghan, in the Republic of Ireland and was arrested in Newry by police after he crossed the Border into Northern Ireland. On 7 February 2008, the Northern Ireland Policing Board decided to appoint a panel of independent experts to review the police’s investigation of the bombing. Some of the relatives of the bombing victims criticised the decision, saying that an international public inquiry covering both the Republic of Ireland and Northern Ireland should be established instead. The review is to determine whether enough evidence exists for further prosecutions. It is also to investigate the possible perjury of two police witnesses made during Sean Hoey’s trial. Sinn Féin Policing Board member Alex Maskey stated that, “Sinn Féin fully supports the families’ right to call for a full cross-border independent inquiry while the Policing Board has its clear and legal obligation to scrutinise the police handling of the investigations.” He also stated that, “We recognise that the board has a major responsibility in carrying out our duty in holding the PSNI to account in the interests of justice for the Omagh families”. It has been alleged that the British, Irish and American intelligence agencies had information which could have prevented the bombing. This information was not given to the local police; the Royal Ulster Constabulary (RUC). The RUC’s investigation into the bombing has also been widely criticized. Police Ombudsman Nuala O’Loan published a report on 12 December 2001 that strongly criticised the RUC over its handling of the bombing investigation. Her report stated that RUC officers had ignored the previous warnings about a bomb and had failed to act on crucial intelligence. She went on to say that officers had been uncooperative and defensive during her inquiry. The report concluded that, “The victims, their families, the people of Omagh and officers of the RUC were let down by defective leadership, poor judgement and a lack of urgency.” It recommended the setting up of a new investigation team independent of the new Police Service of Northern Ireland (PSNI), which had since replaced the RUC, led by a senior officer from an outside police force. Initially, the Police Association, which represents both senior officers and rank and file members of the Northern Ireland police, went to court to try to block the release of the O’Loan report. The Association stated that, “The ombudsman’s report and associated decisions constitute a misuse of her statutory powers, responsibilities and functions.” The group later dropped its efforts. RUC Chief Constable Ronnie Flanagan called the report “grossly unfair” and “an erroneous conclusion reached in advance and then a desperate attempt to find anything that might happen to fit in with that.” Other senior police officers also disputed the report’s findings. Flanagan issued a 190 page counter-report in response, and has also stated that he has considered taking legal action. He argued that the multiple warnings were given by the RIRA to cause confusion and lead to a greater loss of life. Assistant Chief Constables Alan McQuillan and Sam Kincaid sent affidavits giving information that supported the report. The families of the victims expressed varying reactions to the report. Kevin Skelton, whose wife died in the attack, said that, “After the bomb at Omagh, we were told by Tony Blair and the Taoiseach, Bertie Ahern, that no stone would be left unturned … It seems to me that a lot of stones have been left unturned,” but then expressed doubt that the bombing could have been prevented. 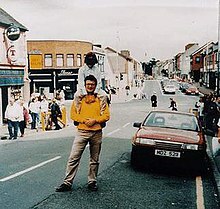 Lawrence Rush, whose wife also died in the attack, said that, “There’s no reason why Omagh should have happened – the police have been in dereliction of their duty.” Other Omagh residents said that the police did all that they could. The Belfast Telegraph called the report a “watershed in police accountability” and stated that it “broke the taboo around official criticism of police in Northern Ireland”. Upon leaving office on 5 November 2007, Nuala O’Loan stated that the report was not a personal battle between herself and Sir Ronnie, and did not lead to one. She also stated that the “recommendations which we made were complied with”. Throughout the conflict in Northern Ireland, the security forces used double agents to infiltrate the paramilitary groups. In 1998 the British, Irish and American intelligence agencies had agents connected to the Real IRA. In 2001, a double agent known as Kevin Fulton claimed he told his MI5 handlers three days before the bombing that the RIRA was about to bring a “huge bomb” across the border. Fulton claims he also told them who he believed was making it and where it was being made. He said that MI5 did not pass his information over to the police. RUC Chief Constable Ronnie Flanagan called the allegations “preposterous” and said the information Fulton gave his handlers was full of “distortions and inaccuracies”. However, Flanagan admitted that some of Fulton’s information was not passed to RUC Special Branch, due to “an administrative error”. In September 2001, British security forces informer Willie Carlin said the Ombudsman had obtained evidence confirming Fulton’s allegations. A spokesman for the Ombudsman neither confirmed nor denied Carlin’s assertion when asked. The Republic of Ireland’s police force, the Gardaí, also had an agent close to the RIRA at the time. The agent, Paddy Dixon, stole cars for the RIRA, who used them to transport bombs. Days before the bombing, the RIRA had Dixon steal the maroon Vauxhall Cavalier it would use in the attack. Dixon immediately told his handler; Detective Sergeant John White. On 12 August, White passed this on to his superior; Detective Chief Superintendent Dermot Jennings. According to White, Jennings told him that they would let the bomb go through, mainly so that the RIRA would not become suspicious of Dixon. Dixon fled the Republic of Ireland in January 2002. The following year, a transcript of a conversation between Dixon and White was released. In it, Dixon confirms that Gardaí let the bomb go through and says that “Omagh is going to blow up in their faces”. In February 2004, PSNI Chief Constable Hugh Orde called for the Republic of Ireland to hand over Dixon. In March 2006, Chief Constable Orde stated that “security services did not withhold intelligence that was relevant or would have progressed the Omagh inquiry”. He also stated that the dissident republican militants investigated by MI5 were members of a different cell than the perpetrators of the Omagh bombing. 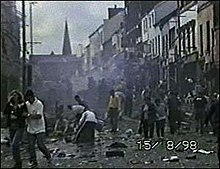 A 2013 independent report concluded that the British, Irish and American intelligence agencies “starved” police in Omagh of intelligence that could have prevented the bombing. The report was commissioned by the victims’ families and produced by Rights Watch (UK). A BBC Panorama documentary, named “Omagh: What the police were never told”, was aired in September 2008. It revealed that the British intelligence agency GCHQ was monitoring mobile phone calls between the bombers as the bomb was being driven into Omagh. Ray White, former Assistant Chief of RUC Special Branch, said GCHQ had been monitoring mobile phones at their request. He said he believed GCHQ were listening to the phonecalls ‘live’, rather than merely recording them for later. Panorama’s John Ware also claimed that a listening device had been hidden in the car and that GCHQ had recordings of what was said. None of this information was given to the RUC in Omagh at the time. Transcripts of the phone calls were later handed over to RUC Special Branch. The families of the victims of the bomb created the Omagh Support and Self Help Group after the bombing. The organisation is led by Michael Gallagher, who lost his 21-year-old son Aidan in the attack. Its web site provides over 5000 newspaper articles, video recordings, audio recordings, and other information sources relating to the events leading up to and following the bombing as well as information about other terrorist attacks. The group’s five core objectives are “relief of poverty, sickness, disability of victims”, “advancement of education and protection”, “raising awareness of needs and experiences of victims, and the effects of terrorism”, “welfare rights advice and information”, and “improving conditions of life for victims”. The group also provides support to victims of other bombings in Ireland, as well other terrorist bombings, such as the 2004 Madrid train bombings. The group has protested outside meetings of the 32 County Sovereignty Movement, an Irish republican political activist group opposed to the Good Friday Agreement that the families believe is part of the RIRA. The bombing inspired the song “Paper Sun” by British hard rock band Def Leppard. Another song inspired by the bombings was “Peace on Earth” by rock group U2. It includes the line, “They’re reading names out over the radio. All the folks the rest of us won’t get to know. Sean and Julia, Gareth, Ann, and Breda.” The five names mentioned are five of the victims from this attack. Another line, “She never got to say goodbye, To see the colour in his eyes, now he’s in the dirt,” was about how James Barker, a victim, was remembered by his mother Donna Maria Barker in an article in the Irish Times after the bombing in Omagh. The Edge has described the song as “the most bitter song U2 has ever written”. The names of all 29 people killed during the bombing were recited at the conclusion of the group’s anti-violence anthem “Sunday Bloody Sunday” during the Elevation Tour; one performance is captured on the concert video U2 Go Home: Live from Slane Castle, Ireland. In late 1999, Omagh District Council established the Omagh Memorial Working Group to devise a permanent memorial to the bombing victims. Its members come from both public and private sectors alongside representatives from the Omagh Churches Forum and members of the victims’ families. The chief executive of the Omagh Council, John McKinney, stated in March 2000 that, “we are working towards a memorial. It is a very sensitive issue.” In April 2007, the Council announced the launch of a public art design competition by the Omagh Memorial Working Group. The group’s goal was to create a permanent memorial in time for the tenth anniversary of the bombing on 15 August 2008. It has a total budget of £240,000. Since space for a monument on Market Street itself is limited, the final memorial was to be split between the actual bombing site and the temporary Memorial Garden about 300 metres away. Artist Sean Hillen and architect Desmond Fitzgerald won the contest with a design that, in the words of the Irish Times, “centres on that most primal yet mobile of elements: light.” A heliostatic mirror was to be placed in the memorial park tracking the sun in order to project a constant beam of sunlight onto 31 small mirrors, each etched with the name of a victim. All the mirrors were then to bounce the light on to a heart-shaped crystal within an obelisk pillar that stands at the bomb site. In September 2007, the Omagh Council’s proposed wording on a memorial plaque — “dissident republican car bomb” — brought it into conflict with several of the victims’ families. Michael Gallagher has stated that “there can be no ambiguity over what happened on 15 August 1998, and no dancing around words can distract from the truth.” The Council appointed an independent mediator in an attempt to reach an agreement with those families. Construction started on the memorial on 27 July 2008. On 15 August 2008, a memorial service was held in Omagh. Senior government representatives from the UK, the Republic of Ireland and the Stormont Assembly were present, along with relatives of many of the victims. A number of bereaved families, however, boycotted the service and held their own service the following Sunday. They argued that the Sinn Féin-dominated Omagh council would not acknowledge that republicans were responsible for the bombing.